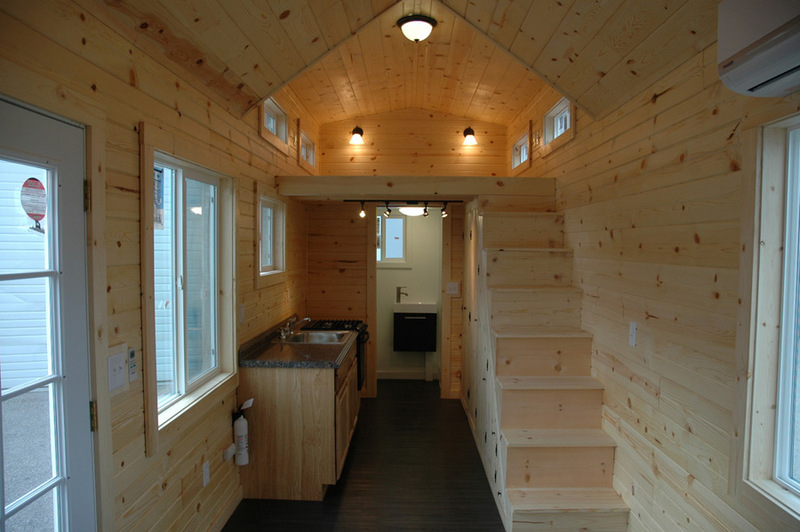 A double axle tiny house on wheels built by Tiny Idahomes in Nampa, Idaho. This is great. Love the stairs that are a bit high, but not unmanageable. That is the first thing I look at. I’m short and old so it’s the most important thing. A banister would have to be added for safety as well. I know they look better without a banister but I think safety is more important than looks. The French door is nice and opens to a nice sized area for some real living room furniture with a spot on the side corner for a wall TV. A banister could be mounted on the wall which, I feel, is a lot sturdier than one mounted to the stairs. This would retain the open air feeling but include this safety feature. If I were designing the French doors, I’d have them so one side slides in a track, but could be locked into position such that both sides break away and fold back. 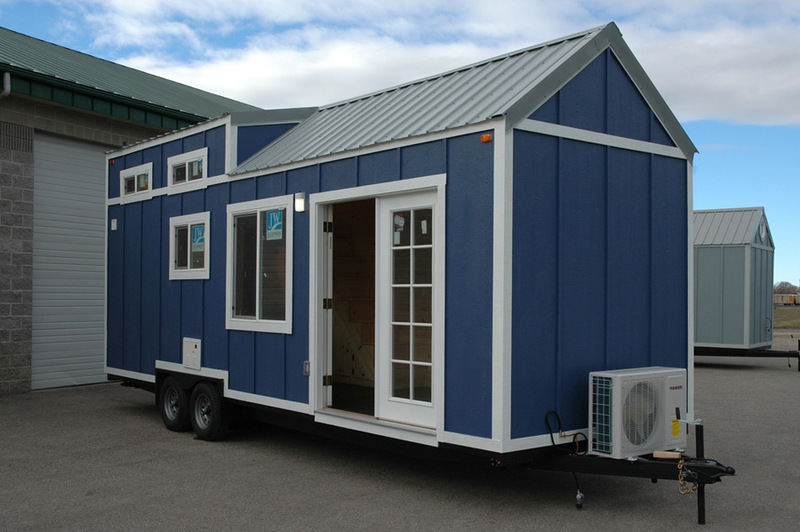 This way you get both halves that fold on themselves and can be opened to the inside but not be intrusive, but in the locked position, only one of the two doors are in use as a sliding door which doesn’t require the swing room internally. I would be asking for the patio doors to be reversed to open outwards so as not to impinge on the interior space. Nice simple straight forward layout. 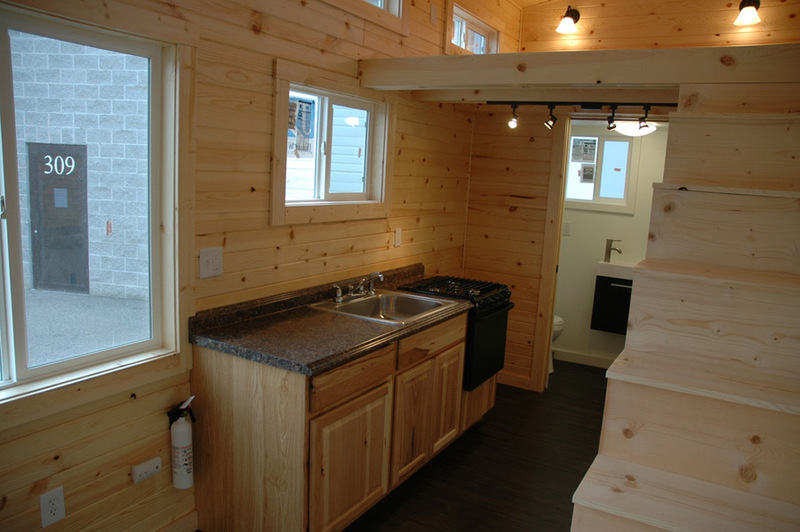 Nice that it has a stove but I couldn’t see a fridge. Like the use of stairs rather than a ladder. Not a huge fan of plain pine so would have to get the paint brush out but one of the most useable I have seen. Quality looks good. 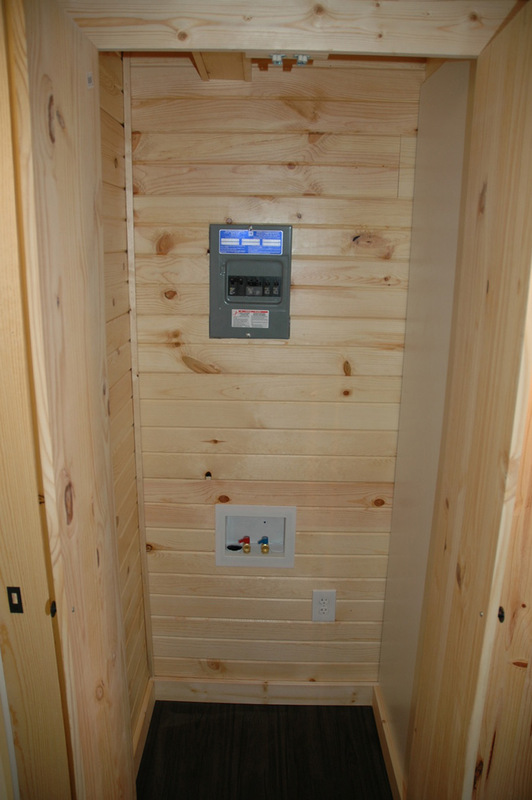 The air handler would work better up in the gable end. 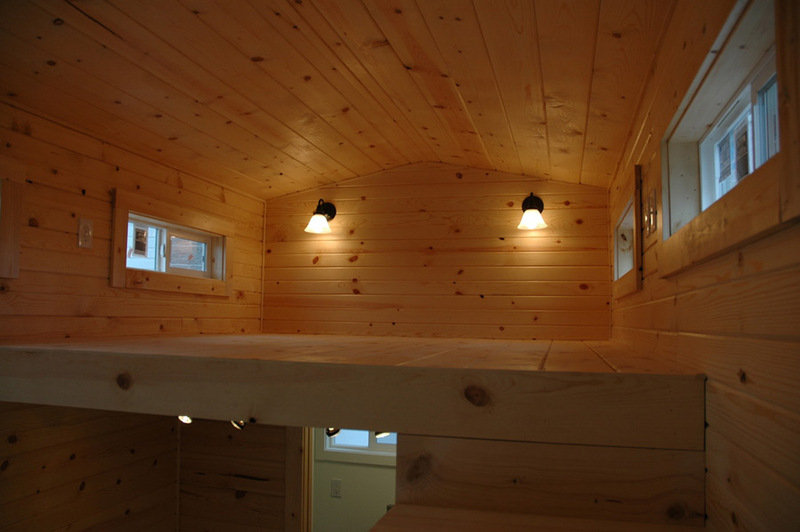 And we know t&g pine paneling is low cost, but you might try changing it up now and then. A little goes a long way. I’m sorry but, this really looks no different than any of the other THOWs built by wannabe manufacturers. 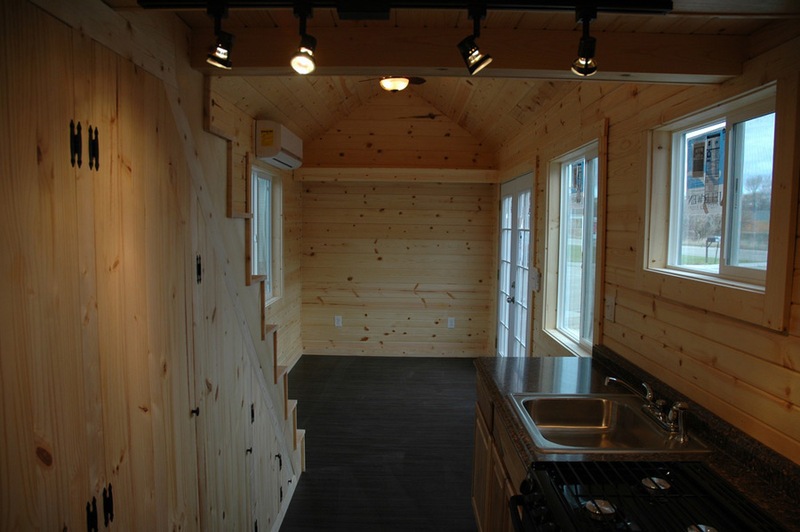 Paint them a little different, put down a different floor, hang some different light fixtures, blah blah blah…. Not impressive!! 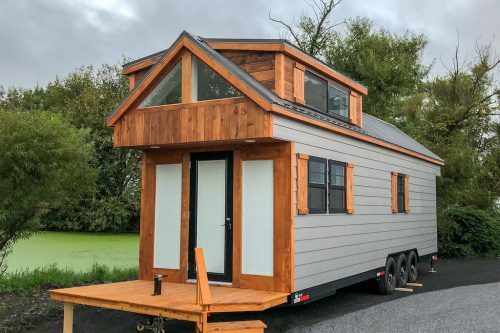 I love all the Tiny Idahomes I’ve seen. They are so livable looking and lots of times they include a way to do laundry. 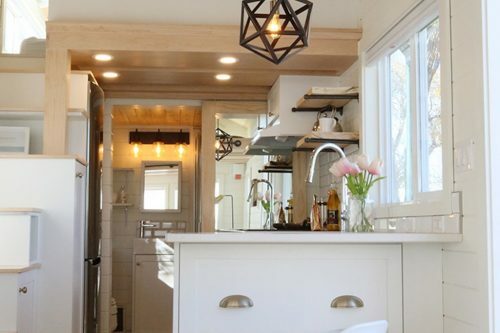 My only complaint is that for me, a range hood is an absolute must in a tiny house. I live in about a thousand square feet and a couple of years ago my range hood died. In the few days it took to order another and have it installed, I was appalled at how grimy my upper cabinets got. My kitchen is probably about a third of my living space so I can’t imagine what not having a range hood would be like in an even tinier space. Okay if you’re not cooking much maybe. Other than that, this is a wonderful space. I could see myself being very comfortable there. I just found you guys today and really love what you’ve done! 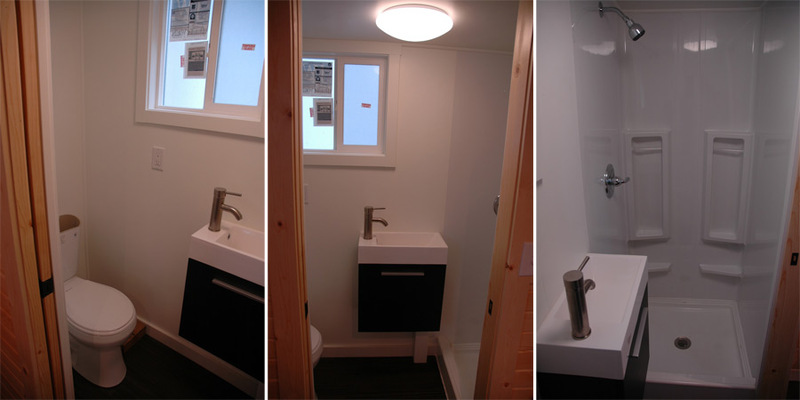 All of your projects I’ve seen are beautiful, look functional and seem well thought out and efficient. 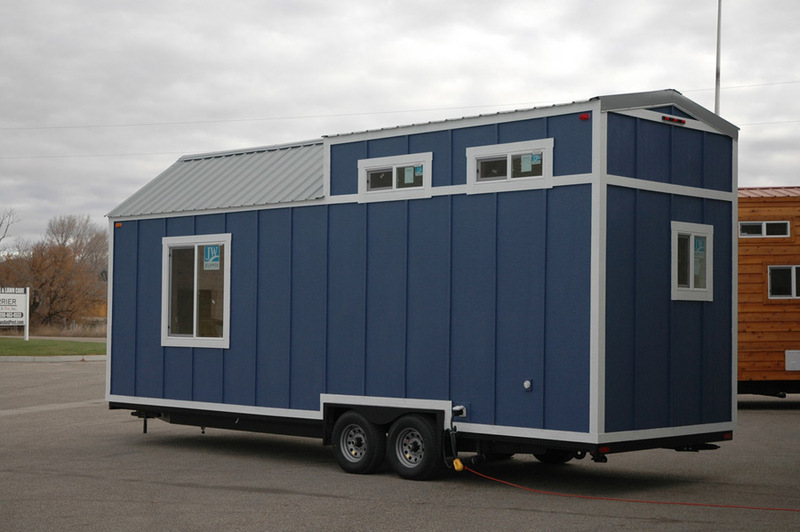 I’m very interested in the small house movement and appreciate you and people/companies like you who are paving the way and helping the rest of us move forward. Thank you!! 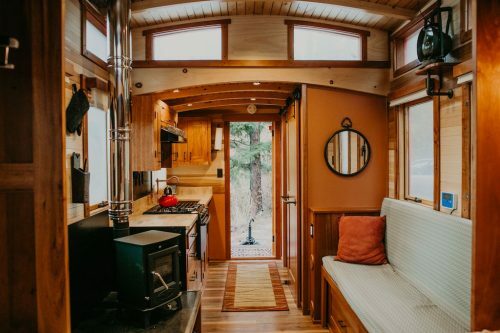 I don’t like the “classic” tiny house design nor the choice of colours, but the space is very well used and I think it’s one of the most comfortable homes. The usage of the room under the stairs as a small closet for storage is great. 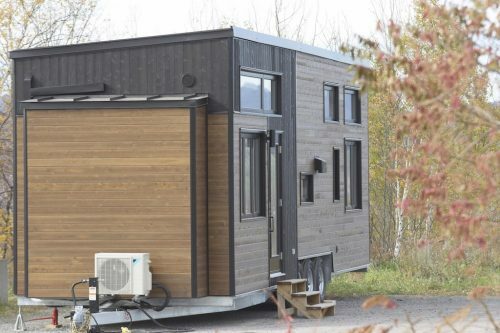 Btw, I’d always sacrifice 50 cm of the living room to broaden the bathroom a bit, as I see they’re always underrated in tiny homes plans…Maybe it’s the fact that I’m Italian, but for me it’s the most important room in a house! Nice but seems a little bit small to me.